Legendary former India and Tamil Nadu forward Simon Sundararaj was felicitated by Chennaiyin FC at his residence in Thanjavur on Sunday. The 81-year-old Sundararaj, who scored India’s last Olympics goal at the 1960 Rome Olympics, was presented with a personalized CFC home jersey by First Team Assistant Coach & Technical Director of Youth Development Syed Sabir Pasha. Sundararaj is the first footballer to represent Tamil Nadu in the national team. He was also a former coach of Pasha’s; back in 2000 when he coached the Tamil Nadu Santosh Trophy team, with Pasha the captain. “I am very happy that Sabir paid me a visit today and I am humbled by the felicitation from Chennaiyin FC. It is very nice of the club to form a connect with former footballers like myself. This also gave me an opportunity to take a trip down memory lane, reminiscing my footballing days. I also shared my views on various matters pertaining to football,” said a visibly delighted Sundararaj, who is famous for his wonderful goal against Peru in India’s last group game in the 1960 Rome Olympics. Hailing from Thanjavur in Tamil Nadu, Sundararaj is a stalwart of Indian football who played during what was arguably its golden era. He contributed both as a player and a coach after, leading Kerala to their maiden Santosh Trophy triumph in 1973. Sundararaj shared his views on coaching, specially focusing on youth development and the approach that needs to be taken to ensure it is done in the right manner. “My advice on nurturing young talent is to allow kids to flourish in their natural way. For instance, when a kid is chipping the ball, we must allow him to do it in his own way. We shouldn’t curb their natural game. "There shouldn’t be a single-minded way of coaching. Coaches must weigh the strong points of a child’s playing style and nurture it accordingly. They shouldn’t restrict them or impose certain set ways of playing football. They should become more open-minded in their approach,” he said. 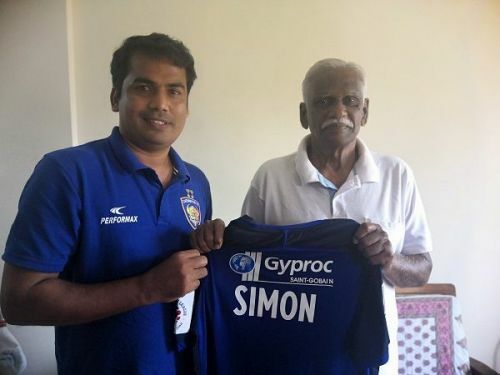 "It was an absolute pleasure meeting Simon sir and felicitating him on behalf of all of us at Chennaiyin FC. He is an inspiration and an icon of Indian football. Young players today from the state and around India need to be reminded of stalwarts like him. "He has brought glory to Indian football, both as a player and a coach. We had a long interaction wherein Simon sir shared his views and valuable advice on youth development and the growth of football in India as a whole," said Pasha.